Glenfine homestead is a substantial, Gothically styled two-storey rendered bluestone residence. Glenfine was designed in 1872 by the architect HR Caselli for pastoralist, William Thomas Rowe. Glenfine was constructed c.1873, although the construction of the north-west section of the building was a later addition by Caselli. The residence has a wide balcony extending around three sides with heavy cast-iron paired columns positioned on the upper verandah and lower porch. The steeply pitched slate roof has bracketed eaves and attic ventilators and an intact glazed conservatory is attached to eastern side of the building. Situated to the rear of Glenfine is a bluestone wall with built-in dairy and adjacent to the house are the timber cook's cottage and the small stone store. Deep lead gold mining on the Pitfield Plains surrounding Glenfine homestead was carried out from the 1890s to 1920s. Several mining companies operated on the Glenfine property during this time. One of the mines- the Glenfine South mine - was located virtually in the front garden of the homestead. The then landowner, William Rowe (jnr) sought commercial gain through providing accommodation for workers for the mines by subdividing a parcel of land near his homestead and creating the private township of Hollybush. By 1900 the township had a population of 426 and comprised a store, a couple of boarding houses and over twenty cottages. The township was in use for some twenty years until the cessation of mining activities in the district. The Glenfine South Mine operated from 1897 to 1908. The mine's gold production and size was not remarkable but what gave the mine a special place in the history of the industry was its massive forty-head stamping battery. The reason for such a substantial battery at Glenfine South was that quartz and deep lead mining was conducted in unison there: one of the few such instances in Victoria's deep lead mining history. The battery was required to crush the quartz. Today its massive foundations and the tailings and 'slimes' generated by the crushing process bear testimony to the mine's unique place in the State's history. 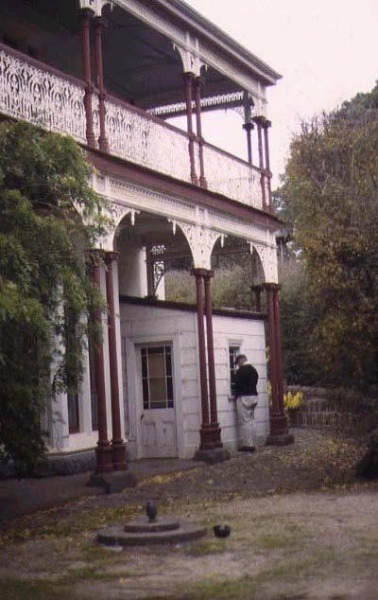 Glenfine homestead precinct is of architectural and historical and scientific significance to the State of Victoria. 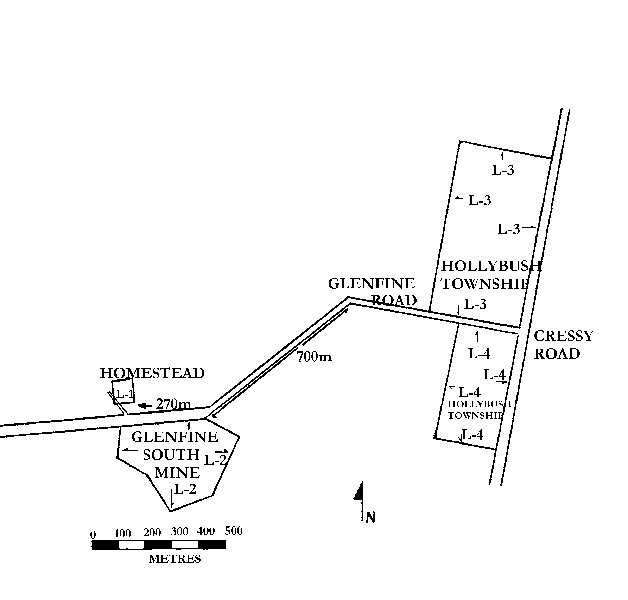 The Glenfine homestead precinct has three elements: Glenfine homestead, Glenfine South Gold Mine, and the site of Hollybush township. Glenfine homestead is of architectural importance as a gothically styled residence, designed by the prominent architect, HR Caselli. Caselli practised primarily in the Ballarat region and was responsible for a number of important buildings within that locale. Glenfine was designed at the height of his career and it demonstrates the architect's concern with design and detail. The distinctively styled homestead, employing eclectic detailing and an asymmetrical plan-form, is an outstanding example of a substantial rural residence and is important for its rare attached conservatory. Glenfine homestead is historically significant as an example of a substantial rural residence, built during an era of prosperity in the latter half of the nineteenth century. The scale and detailing of Glenfine illustrate a period of immense wealth in Victoria's pastoral history. Glenfine is historically significant for its relationship with William Thomas Rowe, a wealthy Victorian landowner who acquired large rural properties in the State's Western District. The Glenfine South Gold Mine is historically important in the State's gold mining history as a rare example of a combined deep lead and quartz operation. The evidence of the mine's battery and the by-products of the crushing process are crucial to the significance of the place. Adding further to the special qualities of the mine are its historical associations with the abutting Glenfine homestead and the nearby mining township of Hollybush. The Glenfine South Gold Mine is scientifically significant because it has one of the finest collections of deep lead mining relics in Victoria. Some 350 deep lead mines have been recorded across Victoria from Rutherglen in the north to the Pitfield Plains in the south. None of these sites possess the range of mining relics that are on display at the Glenfine South mine. The associated township and mine jointly form a significant and unique archaeological resource that could contribute further information on the industrial and domestic faces of turn-of-the-century deep lead mining. Glenfine Homestead Precinct, Cape Clear Road, Cressy, Golden Plains Shire Council. 1. All of the buildings known as Glenfine Homestead as marked B-1, B-2, B-3 and B-4 on Diagram 601265A held by the Executive Director of the Heritage Council Victoria. 2. All of the land marked L-1 on Diagram 601265A held by the Executive Director of the Heritage Council Victoria, being part of the land described in Certificate of Title Volume 9614 Folio 393. 3. All the machinery foundations, mullock heaps, slimes, tailings, earthworks and archaeological features and deposits on the land known as Glenfine South Gold Mine marked L-2 shown on diagram 601265B held by the Executive Director of the Heritage Council being part of Lot 2, LP148608W, Volume 8236 Folio 263, Parish of Commeralghip, Pitfield Plains - Cressy Road, Illabarook. 4. 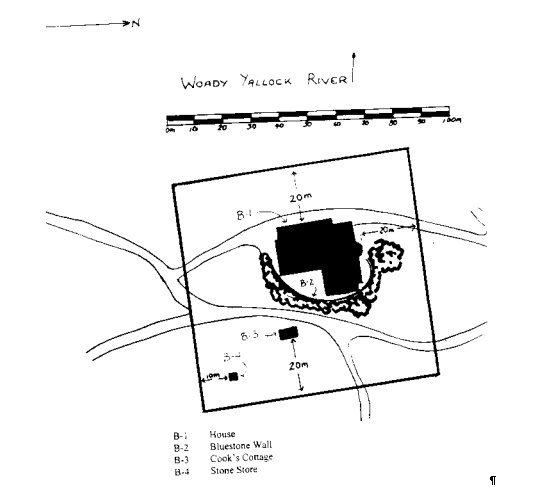 All the foundations, artefacts and archaeological deposits on the land known as Hollybush Township marked L-3 and L-4 shown on diagram 601265B held by the Executive Director of the Heritage Council being all of Lot 1 (Volume No. 10320 Folio No. 636) and Lot 2 (Volume No. 10320 Folio No. 637), Parish of Commeralghip, Pitfield Plains -Cressy Road, Illabarook. Only a small part of the garden in now maintained. *Interior painting/wall papering to walls and ceilings, provided the preparation work for painting/papering does not remove evidence of the building's original paint or decorative scheme. *Removal of existing carpets/ flexible floor coverings. *Installation of carpets and flexible floor covering. *Installation of curtain track, rod, blinds and other window dressings. *Installation of hooks, nails and other devices for the hanging of paintings, mirrors and other wall mounted works of art. *Refurbishment of bathroom/toilet including removal of existing sanitary fixtures and associated piping, mirrors and floor coverings, and installation of new fixtures, and wall and floor coverings. *Removal of existing any benches or fixtures (stoves, dishwashers etc.) and floor coverings and installation of new benches and fixtures, including associated plumbing and wiring. *Re-wiring provided that all new wiring is fully concealed and any original light switches are retained in-situ. *Normal land care maintenance, including weed, pest and soil erosion controls, and removal of fallen trees where necessary. GLENFINE SOUTH GOLD MINING CO.